Reads Landing Brewing Company brews our handcrafted beers on site. Our ingredients are purchased from local vendors per brew to ensure freshness and quality. Our grains are purchased whole and milled on-site. We also mill our brewer’s grains for a local bakery that produces our burger and sandwich buns. Our spent grains are donated to a local farmer. We utilize an all-grain, 3-vessel, 3-barrel all-electric brewhouse with a Brewmation control panel. The wort is pumped into a separate temperature controlled fermentation room where it goes through a traditional fermenting and conditioning process. Drs. Linda and Marvin Seppanen started growing grapes on Garvin Heights over 25 years ago. In 2006 we received their our Federal winery permit and started building a winery building. In 2007 we received our Minnesota farm winery license and opened for wine tasting and retail sales. In 2015 we added the Ridgeview Event Center to host groups of up to 100 guests. See why we call Garvin Heights Vineyards Minnesota’s “Most Scenic Winery”. No appointments needed for groups 10 or less – continuous wine tasting. For more information check out Facebook and become a friend to Garvin Heights Vineyards. Eric and Sandy welcome you to the first post-prohibition brewery in Fillmore County! 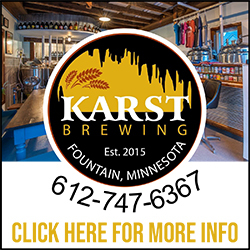 Karst Brewing is a small brewery in the small town of Fountain, MN, and is conveniently located en route to many Bluff Country destinations. Thank you for your interest in our small batch “nano” brewery, where we serve fresh craft beer! 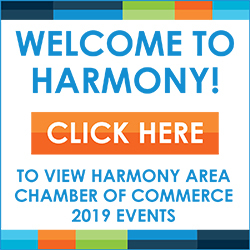 Enjoy a fun, friendly wine experience amidst the beautiful, rolling hills of Northeast Iowa. Winneshiek Wildberry Winery is a family owned and operated winery specializing in award winning fruit and Midwestern grape table wine in Decorah, Iowa. The winery is located on our 150- year family farm between Decorah, Iowa and Mabel, Minnesota. We invite you to spend a day in the country sipping wine and enjoying the seasonal view from the patio! Built out of an old dairy facility and originally situated next to a laundromat, Pulpit Rock Brewing opened its bay doors during the summer of ’15. Founded by four Luther alumni, fueled by two head-brewers and driven by a small taproom team (and the occasional volunteer), this modest brewery embraces the opportunity to produce and serve exciting and innovative beers. With a rotating tap list that balances classic styles, unabashed hop-enthusiasm and adventurous flavor-infusions, we aim to provide our guests with a spectrum of tastes and experiences. Since 2015, Pulpit Rock has honored the craft of brewing. Clark and Barb Lewey founded Toppling Goliath Brewing Company in 2009 here in beautiful Decorah, Iowa, after a runaway success in home brewing. In less than a decade TG has become world-renown for IPAs and barrel-aged stouts, distributes to over 17 states and brews more than 30 beers. In order to meet overwhelming demand, the Lewey’s have built a new 100-barrel system brewery in Decorah, IA which houses our taproom, restaurant, offices and brewery in one location. TG prides itself in crafting truly top shelf beer and is honored to be growing with the support of its many customers worldwide. Our winery is breathtaking & charming, made from our reclaimed 100 year old family barn. Come sit & relax inside or out on our patio & gazebo and your stress will melt away. You must step foot inside to appreciate this beautiful venue! Our winery tasting room has a fun & relaxed atmosphere so you can meet friends to taste & enjoy a glass of wine, sangria, pint of craft beer, cider or cans of your favorite beer and always free popcorn to munch on. We have 10 taps of craft beers and hard ciders. Eagles Landing Winery is a small family business located in downtown Marquette, Iowa, along the Mississippi River on the Great River Road. We are located 3 miles from Pikes Peak State Park, 3 miles from Effigy Mounds National Monument, 10 miles from Yellow River State Forest and 15 miles from Wyalusing State Park in Wisconsin. Our first grapes where planted in 1999 and have been producing our own “Marquette Maid” branded wines since 2003. Our wines can be found at over 135 locations in Iowa and Wisconsin. Turning grapes into wine and strangers into friends. PromiseLand Winery is a family-run operation, located in the Southern hills of Guttenberg, IA, on the Great River Road. Owners, Pat and Cindy Wachendorf, offer a one-of-a-kind experience, that will make you feel right at home. Inside the winery, you will find a spacious tasting room, an event room that can be used for small to medium-sized parties, and 6 boutiques that will fulfill your shopping needs! Feel free to take a walk or drive up to our vineyard to see where our award-winning wines began. Enjoy some music in the front courtyard when the weather is nice or warm up by a cozy fire when it’s too cold to be outside!